According to Gunjan Singh (web designer) article, Needless to say, the design of your website attracts visitors and contact us page helps them to get connected with you. It increases your conversion rate and easily builds trust between you and your customer. However, sometimes people never give proper attention to it, which in result de-motivate the customers and they drop out their idea to do business with you. 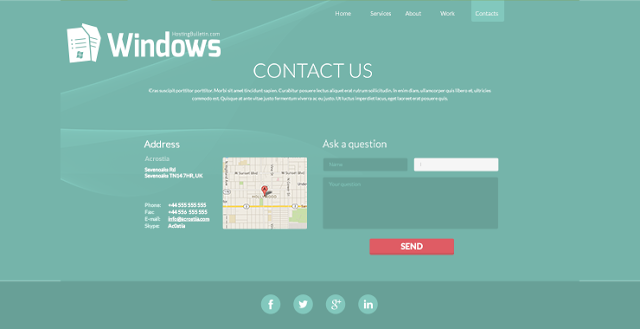 So, do you have a perfect contact us page? Don't know what elements to include? Here are some simple tips that help you to design it in a manner that satisfy the demand of your clients. Provide a Complete Physical Address: One of the most important things your contact us page must have is the complete detail of your physical address. It may help to build the trust among clients that your business is not a bluff but have an actual presence, where they can even visit personally, if they have any doubt, before start working with you. No doubt, social media has the power to change the world and getting connected with the customer over these platforms make a huge difference in your professional relationships. Therefore, you should create your presence on different social media platforms because it helps to target a wider audience and don't forget to include their link on your contact us page, so, that they can easily reach you. If your office situated at a place that can be tough for a customer to find, so, you should include a map on your contact us page. This may give the complete direction to your clients so they can easily reach you without any inconvenience. Last but not the least important things your contact us page must have is an enquiry form. It is quite convenient for a customer to tell your requirements. Make sure the enquiry forms you include ask only what is necessary than the past, present and future of the customer, otherwise, it may disappoint them and they get frustrated and leave your website immediately.